As expected, “choking hazzard” was NOT the culprit but rather the effect of an old adversary that’s mentioned quite often throughout this STEROIDANALYSIS.com website. - Severe cardiomegaly with concentric left ventricular hypertrophy in which the heart is enlarged. Left ventricular hypertrophy is enlargement and thickening (hypertrophy) of the walls of your heart’s left ventricle. - Hepatomegaly is the condition of having an enlarged liver; potentially involving infection, hepatic tumours, or metabolic disorder. - Hypertrophy of kidneys pertains to slight enlargement of kidneys; a condition often experienced by steroid users who often share an increased thirst-sensation (as evidenced by obvious steroid users who carry/consume gallons of water during their workouts). - Papillary thyroid carcinoma (PTC) is the most common form of well-differentiated thyroid cancer. Papillary carcinoma appears as an irregular solid or cystic mass or nodule in a normal thyroid parenchyma. Lymphatic spread is more common than hematogenous spread. The so-called Lateral Aberrant Thyroid is actually a lymph node metastasis from papillary thyroid carcinoma. Note: we’ve established a strong correlation between steroid use and strong probability of lymphatic cancer within steroid-using subsets among normally distributed population. Doctor(s) who performed the autopsy also listed contributing factors including “chronic” use of Exogenous steroid hormones. 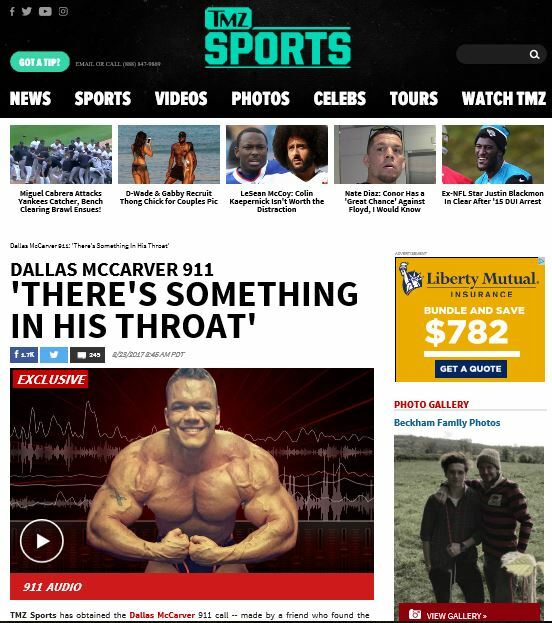 Among substances found in McCarver’s system was a steroid stack including Trenbolone Metabolite (17a-trenbolone). We at this STEROIDANALYSIS.com website have persistently warned against the use of steroids & hormones; often listing the same set of well-known side effects. Nonetheless, PED distributors continue to down-play these warnings and even suggest that there are ways to mitigate said impact. There are numerous steroid users and dealers who’ve posted videos on Youtube, Facebook, Instagram, Twitter, etc… with the purpose of deflecting responsibility elsewhere. Question: when will current or potential users return to reality. 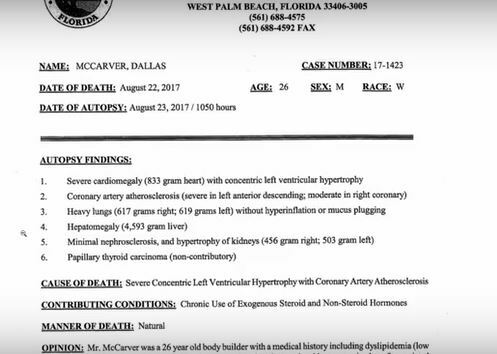 It’s reasonable to believe that Dallas McCarver abused steroids under the very close oversight of a licensed doctor who should’ve been able to mitigate the effects listed above. Yet, why did Dallas die anyway? Is it logical that there are readily available resources to thwart deadly effects of steroid use yet deaths continue to occur? Answer: there’s no way to assuredly reduce the risk of heart attack and lymphatic cancer. There’s no amount of antidote, extent of water consumption, diet, supplement that will offset the side effects that WILL cause major damage to 100% of users!! !